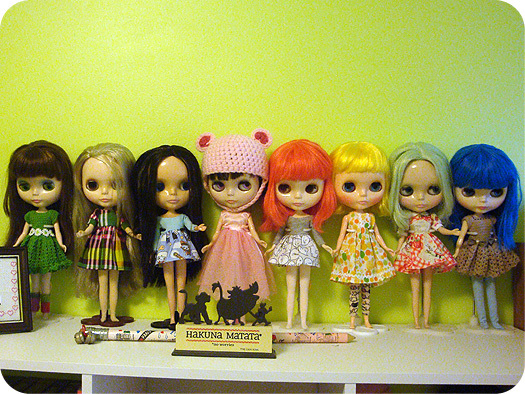 The majority of my Blythes used to live on my desk (prior to that, they were on a set of drawers). I got into Operation: Clean Room this summer, which still struggling to be realized on the grand scale, but I did manage to do some things to get my life a bit more organized. I haven’t gotten everything quite to where I want it just yet, but it’s getting there. I started off by going to Michaels when they had a craft storage sale (50% off!) and then there was an additional coupon that could be applied to sale items (even better!) so I bought myself a small shelf unit. It now lives on its side, on top of my desk. 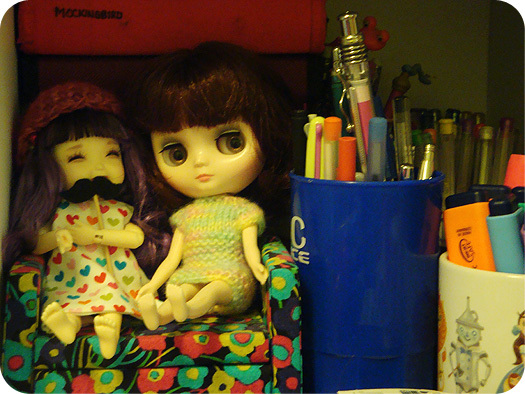 I essentially have six cubes on my desk where the majority of my Blythes live on top of. Each cube has been slowly filled with goodies. The shelf unit I picked is a Recollections shelf unit (it’s called Recollections 6 Cube Organizer) because I had the time to wait for it to go on sale. The total price, after tax, ended up being less than $20CAD for the unit, which was a lot cheaper than similar looking shelves from other stores. At full retail price, it would have been more on par with other stores, so it was a better deal overall after applying the sale discount and additional coupon. I won’t be showing you the other cubes, mostly because they’re a tad disorganized still (whoops), but one of my cubes has Cedar (Monique Magnifique) and Bennett (Margaret Meets Ladybug). 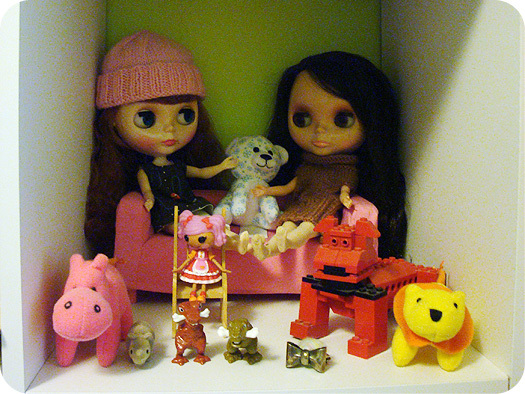 They have some trouble standing up straight on the clover Blythe stands because their hair makes them quite top heavy, so they get to sit on the pink KLIPPAN from the Ikea HUSET furniture set. There’s some other minis in the cube with them, just because. Directly below that is a cube that consists of my CDs, as well as pencils, pens, gel pens, highlighters and my lovely Smidge House sofa where Joy (Doll Leaves BJD) and Kitty Brighton (Jackie Ramone Middie) hang out. From left to right is: Kindred (Velvet Minuet, SBL), Sophie (Cappuccino Chat, RBL), Belarus (Love Mission, EBL), Eden Mouse (Punkaholic People, RBL), Moxie (Simply Bubble Boom, FBL), Minnow (Hi-Ho! Marine, RBL+), Tertiary Jane (Simply Peppermint, RBL), and Mollie (Simply Sparkly Spark, FBL). For those wondering, my Kenners (Emmalynn, Primrose, and Lillian Rose), as well as my custom Blythes (Halo and Cameo) are often not on display. This is due to lack of space and stands. They are often wrapped up and tucked away unless they are attending a meet, or taking part in a photoshoot. Heck yeah, I love hitting the storage section when it’s on sale and couponing up! !